The provisions of this purchase order shall be governed by the laws of California. 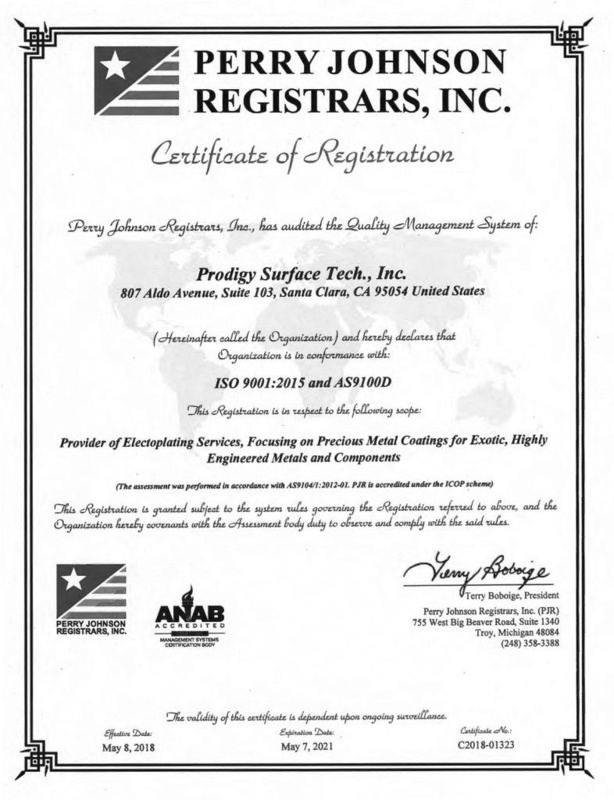 Prodigy Surface Tech Inc. Purchase Order Standard terms and Conditions. Incorporation by Reference. All terms and conditions of the solicitation, and any changes thereto, are made a part of this Purchase Order. Specifications: All materials, equipment, supplies or services shall conform to Fed­eral and State laws and regulations and to the specifications, prints or other technical data con­tained in the solicitation. Changes: This Purchase Order may be amended with the consent of both parties. Amendments may not change signifi­cantly the scope of the Purchase Order. Packing List: A packing list must accompany each shipment. Delivery: The materials listed in purchase order shall be delivered FOB destination to the point or points specified on this Purchase Order prior to or on the date specified in the bid or proposal. Delivery shall be made in accordance with the solicitation specifi­cations. If unable to make shipment for delivery by the Purchase Order due date specified, notify procurement department at once. Qualification of Personnel: Supplier shall oversee requirements for qualification of personnel including awareness of product and service conformity, product safety and importance of ethical behavior. When specific qualifications need to be met they shall be addressed in detail on the PO and shall flow down to any sub tier suppliers. Quality Management System Requirements : When identified on the PO and shall flow down to any sub tier suppliers. Design Test and Inspection: All test and inspection requirements including definition of critical items and key characteristics, inspection, and test requirements (including use of statistical techniques) and other requirements identified on the Purchase Order or accompanying documents shall be met. Nonconforming Product: Any nonconforming product submitted shall be identified and segregated. Any material that is defective or fails to meet the terms of the solicitation specifications shall be rejected. Rejected materials shall be promptly returned for credit or replacement. Process Changes: Supplier shall notify Prodigy Surface Tech of any changes to product, process, sub-tier suppliers and facilities in advance of shipment. Flow down: All requirements incorporated into this Purchase Order shall be applied to any subcontractors used by supplier (including requirements in the purchasing documents and key characteristics where identified). Compensation: Vendor shall be paid only for items or services that are specifically named in this Purchase Order. No additional costs for items or services will be paid without its prior express written consent. Payment: Payments to the Contractor pursuant to this Purchase Order shall be made no later than thirty (30) days after receipt of invoice. Record Retention: For any Purchase Order with special terms and conditions (SC1 to SC6) supplier shall maintain records for 7 years. For all other purchase orders a minimum of 3 years is required. Right of Entry: If requested you will allow PST Personnel the “Right of Entry’ into the Vendor’s Facility or any area necessary to determine compliance with a purchase order. If so, the vendor will provide reasonable facilities and assistance to expedite any visits. Indemnity: The Seller agrees to defend, indemnify and hold harmless the Buyer from and against any and all claims, losses, damages and settlement expenses resulting from or arising out of a breach of the Seller’s express warranties and those implied by statute, and of which the Buyer notifies the Seller at any time. The Seller expressly warrants that all goods and services supplied pursuant to this order will comply with the specifications, drawings, description or samples furnished or specified by the Buyer and that the same will be merchantable, of good quality material and workmanship, free from defects and fit for the purpose intended, preventing counterfeit material. Conflict Minerals: The Seller expressly warrants that metals are not from sources identified with the Democratic Republic of Congo (DRC) or adjoining countries (a country that shares an internationally recognized border with the DRC, which presently includes Angola, Burundi, Central African Republic, the Republic of Congo, Rwanda, South Sudan, Tanzania, Uganda and Zambia; Collectively, together with the DRC, the “Covered Countries”). Gold, and or any other mineral or its derivatives determined by the Secretary of State to be financing conflicts in the Democratic Republic of Congo (DRC). SC1 [ ] Certificate of Conformance – Special Process/Testing: If checked, a Certificate of Conformance is required and must follow instructions from P.O. SC2 [ ] Certificate of Analysis – Lab Chemical or Raw Materials: If checked, include a Certificate of Analysis for all Items listed..
SC3 [ ] Certificate of Analysis – Stock Chemicals: If checked, list Lot Numbers traceable to a Certificate of Analysis on Packing Slip or submit a Certificate of Analysis. SC5 [ ] Material Safety Data Sheet – Chemical: Safety Data Sheet (SDS) for all chemicals received unless already on file. SC 6 [ ] Verification of Product Conformance/Services Performed: Verification of Product Conformance by Management, Quality or Engineering before release to production or use. SC7 [ ] Regulatory Compliance Records: required by current environmental laws and regulations shall be supplied.